Originally published under the title "Erdogan Cosies Up to Putin as Turkey Makes Trouble." The assassination on Dec. 19 in Ankara of the Russian ambassador to Turkey, Andrey Karlov, raises some major geopolitical issues: Will this act of violence break relations between the two countries, isolate Turkey, or – counterintuitively – improve their ties? And does this murder affect the Middle East and the world beyond? 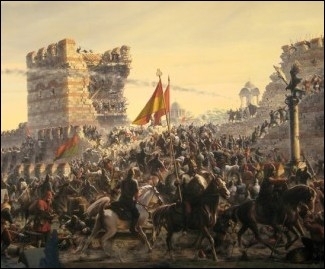 The siege of Constantinople, 1453. Turks and Russians have a long and complex history that starts with the Ottoman conquest of Constantinople in 1453 and the Russian dream to win it back for Orthodox Christianity. The two states fought twelve major wars in the 3½ centuries between 1568 and 1918, had a flurry of good relations under Atatürk and Lenin which went south with Stalin, improved substantially in 1991 upon the Soviet Union's dissolution, then subsequently plummeted (2015) and revived (2016). Generally, Russians have enjoyed the whip hand. They won most wars, occupied most land, and came away with better terms in treaties. Turks long ago realized their need of Western support to fend off Russia: thus, they won support from a 4-power coalition in mid-nineteenth century, the Central Powers in World War I, and the North Atlantic Treaty Organization (NATO) during and after the Cold War. Fear of Moscow has influenced Turks in deeper ways too, steadily inclining them toward Western ways; of all Muslims, Turks have been the most open to Western influence, from drinking wine to building democracy. A Turk, Kemal Atatürk, not coincidentally stands out as the most influential Muslim Westernizer. These centuries-old patterns remained mostly in place until the strongman Islamist president of Turkey, Recep Tayyip Erdoğan, decided in November 2015 to bring down a Russian war jet for allegedly breaching Turkish airspace. Whatever his reason – perhaps retaliation for a comparable shooting down of a Turkish plane by Syrian forces in 2012 – this capricious act both infuriated Russia's President Vladimir Putin and alienated NATO leaders. Put in schoolyard terms, the little bully misjudged in taking on the big bully. Erdoğan eventually realized his mistake. In June 2016, he swallowed his engorged pride, apologized to Putin, humbly visited him in Russia, and partially retreated from those Turkish policies in Syria that contradicted Putin's. Without betraying affection or trust for Erdoğan, the Russian leader absorbed these concessions and resumed cooperating with him. The murder of Russia's ambassador to Turkey on December 19 was the more stinging because it took place on camera. 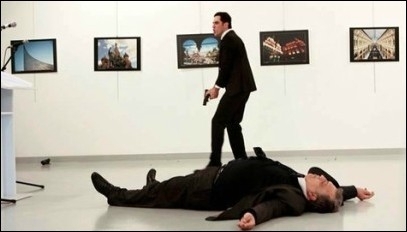 Then, this past Monday, came the assassination of the Russian ambassador at an art exhibit, of all places, made the more horrifying and vivid by a high-resolution video of the violence. The murderer, Mevlüt Mert Altıntaş, 22, made explicit his outlook and purpose by shouting before his own death by gunfire, "We are the ones who obey the call of jihad! Allahu Akbar! Don't forget Aleppo! Don't forget Syria!" Assuming someone who yells slogans as he murders and is killed tells the truth, Altıntaş was a Sunni jihadi lashing out against Russian military help in Syria for the enemies of other Sunni jihadis. As is their wont, the Turkish authorities rushed to pronounce Altıntaş an agent of one mortal domestic enemy, the Hizmet movement of Fethullah Gülen. Once close allies, Gülen and Erdoğan murderously fell out in a tiff over power in 2011. Since then, Erdoğan has been trying to crush Gülen and his millions of adepts by blaming every problem on them. Pinning Altıntaş on Gülen both fit that hackneyed narrative and signaled Moscow that the Republic of Turkey sees the murderer as their mutual enemy. Putin obligingly responded in kind, ascribing the murder to "terrorism" and not holding Erdoğan's team responsible. 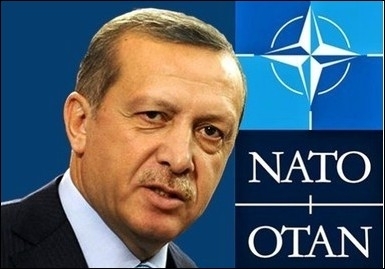 Recep Tayyip Erdoğan may not like NATO but he needs it. Indeed, in an ironic contrast to Altıntaş' presumed wishes, his act of violence brought the two strongmen closer together; a Chicago Tribune analysis finds "Russia reaping political benefits by arguing that it has paid a high price for fighting terrorism as Turkey, embarrassed by its security breaches, increasingly coordinates with Russia in neighboring Syria." That said, relations between the two states remain fraught with tensions: Historic enemies remember grudges. Bullies cannot form a stable relationship. Opponents in Syria's civil war cannot smooth over contrary goals. Structurally, Ankara needs NATO; so, talk of its joining the Shanghai Cooperation Organisation, the Russian-Chinese counterpart to NATO, appears to be blather for pressuring Westerners. Karlov's murder highlights how, as Turks increasingly self-isolate and go rogue, this country of 75 million becomes a leading source of instability. While still a member of NATO, Erdoğan's Turkey, now challenges Khomeinist Iran for the title of the Middle East's most dangerous regime.